Slice zucchini and squash; cut tomatoes into1-inch pieces. Chop basil. Cut sausage into small, bite-size pieces (wash hands). Combine zucchini, squash, onions, 1 Tbsp oil and seasoning; set aside. Preheat large saute pan on medium-high 2-3 minutes. Place remaining 1 Tbsp oil in pan, then add sausage; cook and stir 4-5 minutes or until no pink remains. Remove sausage from pan. 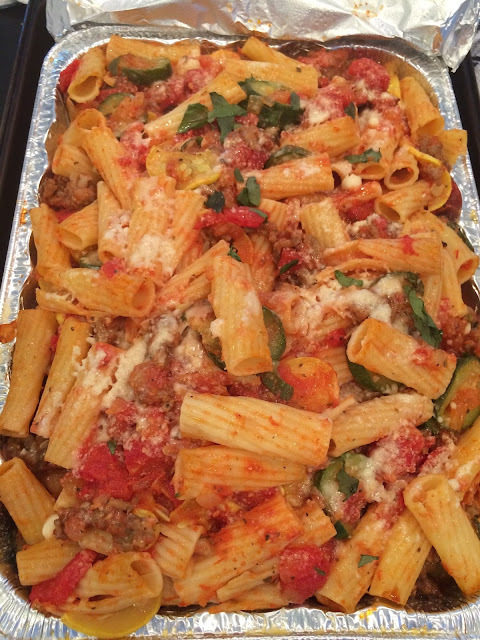 Reduce heat to low; stir in tomatoes, pasta, sausage and pasta sauce, then cover. Simmer 1-2 minutes or until thoroughly heated. Top with basil and cheese; serve.